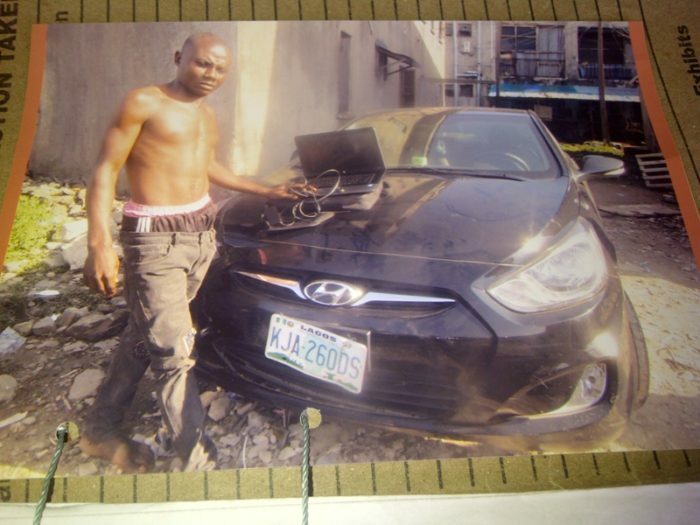 A security man attached to Halogen Security Services Limited, Lagos, Joseph Aba, 27, who allegedly stole a Hyundai Accent Car with Reg. number KJA 260 DS value at N5 million at Phase 3 Communication Nigeria Limited office,Victoria Island, has been arrested at Iyana Oworo area of the state. In a report by PM News, Aba reportedly stole the car the same day he was employed. He was arrested at Iyana Oworo bus stop area after the car suddenly stopped on his way to Benue State. He was arrested by the Divisional Police Officer, DPO in charge of Bar Beach Division, CSP Olusegun Ajamolaya following complaints by the management of Halogen Security Services Limited through its Compliance Officer, Mr Ezechukwu Iroha. According to the police, the incident occurred on 30 September, 2017 at 22, Ologun Agbaje Street,Victoria Island, Lagos when the suspect secured employment with Halogen Security Services Limited and was posted same day to Phase 3 Communication Nigeria Limited. The police further alleged that after all workers of the company had closed for the day, the suspect entered the office’s reception to pick the key to the Hyundai car and stole one HP Laptop valued at N124,000 and drove the car en-route to Benue State to sell, but unknown to the suspect, the car was fitted with security gadgets. A police source said that following a report of the car theft by the management of Halogen Security Services, CSP Ajamolaya swung into action with his men and tracked the stolen car to Iyana Oworo bus stop and arrested the suspect at the scene and took him and the car to the Station. During interrogation, according to the Police, the suspect allegedly confessed to the crime that he stole the car to use it for commercial purpose in Benue State or sell it off and use the money to start his life. Aba was arraigned before an Igbosere Magistrate Court, Lagos on a one count charge of stealing. Police prosecutor, Inspector Abbass Abayomi told the Court in charge. No C/64/2017 that the accused stole the car at the premises of Phase 3 Communication Nigeria Limited where he was posted the same day he was employed to provide security. The accused however pleaded not guilty to the alleged crime and Chief Magistrate Mrs A.O Komolafe admitted him on bail in the sum of N2.5m with two surties in like. Sum. Komolafe. Adjourned the case till 14 November,2017 for mention and ordered that the. Defendant be. Remanded at Ikoyi Prison,Lagos till when he is able to fulfill the bail conditions.